The Event Horizon Telescope project, an international effort to link radio telescopes across Earth to build a planet-sized telescope with superb angular resolution has made the first image of a black hole. The image is of gas surrounding a black hole of nearly six billion solar masses in the galaxy M87. LISA will measure the mergers of massive black holes which are the ancestors of these supermassive black holes. O3, the third observing run of the advanced ground-based gravitational wave detectors has begun after the LIGO and Virgo teams have spent over a year upgrading their instruments to improved sensitivities. O3 is expected to last for a full year with increased event rates. O3 will also feature low-latency, public alerts which will enable follow-up of gravitational wave events by a variety of astronomical facilities. The LIGO Scientific Collaboration has released the results from their first two observing runs which includes four new black hole mergers in addition to the six previously-announced black hole mergers and the one neutron star merger. Details can be found on LIGO's O1/O2 catalog page. The first data set for the LISA Data Challenge has been released by the LISA Consortium. If you'd like to try your hand at extracting gravitational wave sources from simulated LISA data, you can download tools and data at the Data Challenge Website. The deadline for entries to this first challenge will be near the end of 2018. The scientific program for the 12th International LISA Symposium is now posted on the conference website . The meeting will feature talks on the LISA mission, enabling technologies, data analysis, astrophysics, and related topics. Over 200 researchers from around the world will attend the conference in Chicago July 8th-13th. Late registration will be available until the start of the conference. The Gravity Recovery And Climate Explorer Follow-On (GRACE-FO) mission launched from Vandenberg AFB on a mission to map the Earth's gravitational field. While the primary spacecraft systems are a rebuild of the original GRACE mission, GRACE-FO carries the Laser Ranging Interferometer (LRI) technology demonstration which will use laser interferometry to measure nanometer changes between the two GRACE-FO spacecraft flying roughly 300km apart from one another. The LRI was built by a US-German collaboration that includes many LISA veterans and takes advantage of technologies that were originally developed to support LISA. The advancement of these technologies for GRACE-FO now adds experience that can be applied to LISA. The LISA Symposium being held in Chicago, IL on July 8-13 is still accepting registrations. This is the 12th edition of the once-per-two-year meeting that covers all aspects of LISA including mission development, instrumentation, theory, analysis, and astrophysics. The Abstract deadline closed on May 9th, 2018. Abstract submissions are open for the 12th International LISA Symposium, to be held 8-13 July 2018 in Chicago, IL. Submissions can be made at the abstract submission page. The LISA Symposium is a wide-ranging conference that addresses the broad astrophysical scope of LISA science, mission, and technology development, as well as challenges and interesting questions facing the astrophysics and gravitational wave community. If you still have not registered for the Symposium, visit the registration page. We are looking forward to seeing you in Chicago this summer! NASA is pleased to announce the LISA Preparatory Science (LPS) solicitation, as part of ROSES2018 (element D.13). The LPS will support science data analysis and LISA-related astrophysics research of US-based scientists. As part of the international LISA Consortium, US investigators will conduct research projects aimed at augmenting and complementing the LISA Consortium Data Analysis Work Packages as well as NASA LISA Study Office science and data activities . Proposers for the LISA Preparatory Science (LPS) solicitation should consult the LPS FAQ that is available at the NSPIRES website. The 12th International LISA Symposium will be held in Chicago, IL on July 8-13. This biennial meeting covers the full range of LISA topics including astrophysics, data analysis, technology development, and mission development. This year's Symposium is hosted by the Center for Interdisciplinary Exploration and Research in Astrophysics (CIERA) at Northwestern University, and co-sponsored by the American Astronomical Society. Registration and hotel reservations are open now and Abstract submission will open soon. Gravitational waves were first theorized by Albert Einstein. They are created during events such as supermassive black hole mergers, or collisions between two black holes that are billion times bigger than our Sun. These collisions are so powerful that they create distortions in spacetime, known as gravitational waves. Gravitational waves detectable by the LISA mission could also come from other distant systems including smaller stellar mass black holes orbiting supermassive black holes, known as Extreme Mass Ratio Inspirals (EMRIs). There are many astrophysical phenomena that are either very dim or completely invisible in any form of light that astronomy has relied on for 400 years. Gravitational waves are a powerful new probe of the Universe that uses gravity instead of light to take measure of dynamical astrophysical phenomena. Studying gravitational waves gives enormous potential for discovering the parts of the universe that are invisible by other means, such as black holes, the Big Bang, and other, as yet unknown, objects. LISA will complement our knowledge about the beginning, evolution and structure of our universe. Why do we need to go to space? A space-based configuration allows for an extremely large detector to study regions of the gravitational wave spectrum that are inaccessible from Earth. Click Image to Zoom. There are promising detection techniques across the entire gravitational wave spectrum, which is populated by a broad range of astrophysical sources. The spectrum in the region probed by LISA is one of the most interesting, populated by a rich diversity in astrophysical phenomena of interest to astronomers and astrophysicists. 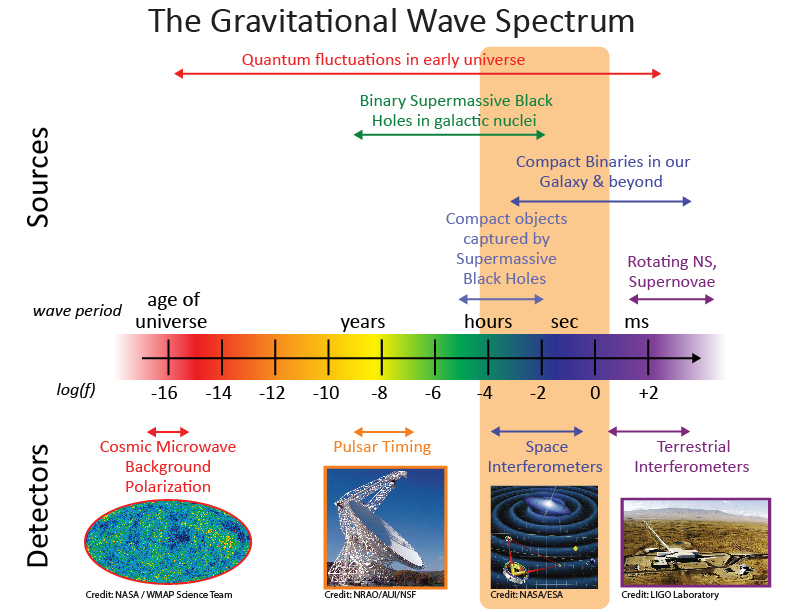 The gravitational wave spectrum covers a broad span of frequencies. LISA operates in the low frequency range, between 0.1 mHz and 1 Hz (compared to LIGO's frequency of 10 Hz to 1000 Hz). The difference means that the waves LISA is looking for have a much longer wavelength, corresponding to objects in much wider orbits and potentially much heavier than those that LIGO is searching for, opening up the detection realm to a wider range of gravitational wave sources. LISA has three spacecraft that form an equilateral triangle in space where the sides of the triangle, also called LISA's "arms", extend about a million miles. Therefore, from space, LISA can avoid the noise from Earth and access regions of the spectrum that are inaccessible from Earth due to these extremely long arms. The gravitational wave sources that LISA would discover include ultra-compact binaries in our Galaxy, supermassive black hole mergers, and extreme mass ratio inspirals, among other exotic possibilities. LISA is a space-based gravitational wave detector constructed of three spacecraft separated by millions of miles. LISA consists of three spacecraft that are separated by millions of miles and trailing tens of millions of miles, more than one hundred times the distance to the Moon, behind the Earth as we orbit the Sun. These three spacecraft relay laser beams back and forth between the different spacecraft and the signals are combined to search for gravitational wave signatures that come from distortions of spacetime. We need a giant detector bigger than the size of Earth to catch gravitational waves from orbiting black holes hundreds of millions of times more massive than our sun. NASA is a major collaborator in the European Space Agency (ESA)-led mission, which is scheduled to launch in the early 2030s and we are getting ready for it now! How does LISA Detect Gravitational Waves? Gravitational wave events will cause the three LISA spacecraft to shift slightly with respect to each other. A bit like the objects moving on the surface of a pond produce ripples and waves, massive objects moving in space distort the fabric of spacetime and produce gravitational waves. 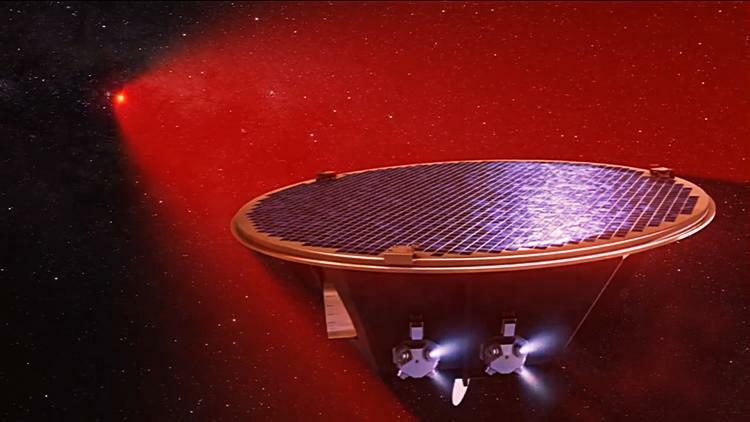 Some of these gravitational wave events will cause the three LISA spacecraft to shift slightly with respect to each other, as they "ride the gravitational waves", to produce a characteristic pattern in the combined laser beam signal that depends on the location and physical properties of the source. These signals are extremely small and require a very sensitive instrument to detect. For example, LISA aims to measure relative shifts in position that are less than the diameter of a helium nucleus over a distance of a million miles, or in technical terms: a strain of 1 part in 1020 at frequencies of about a millihertz. The LISA Pathfinder Mission was a proof-of-concept mission to test and prove the technology needed for LISA's success. 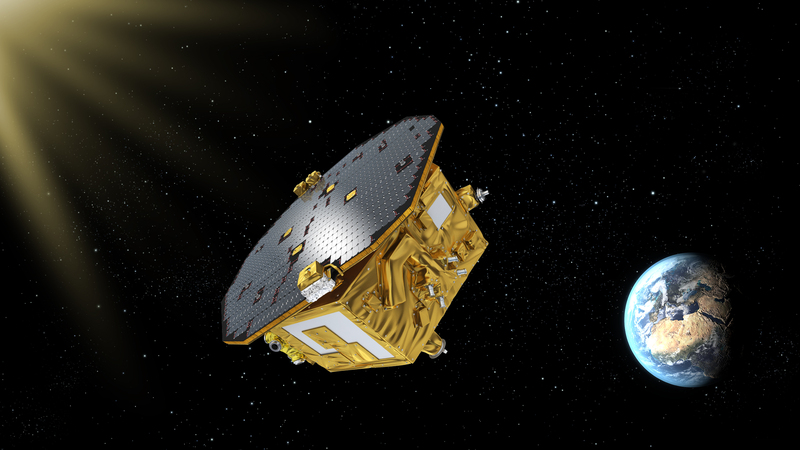 LISA Pathfinder Mission was a proof-of-concept mission for LISA. LISA Pathfinder was launched on December 3, 2015 as a proof-of-concept that tests that the noise characteristics of free-floating test masses within the spacecraft are small enough compared to an expected gravitational wave signal. Completing its mission in July, 2017, LISA Pathfinder has shown that the low noise levels surpassed the original requirements, demonstrating that key technology for LISA is well underway. 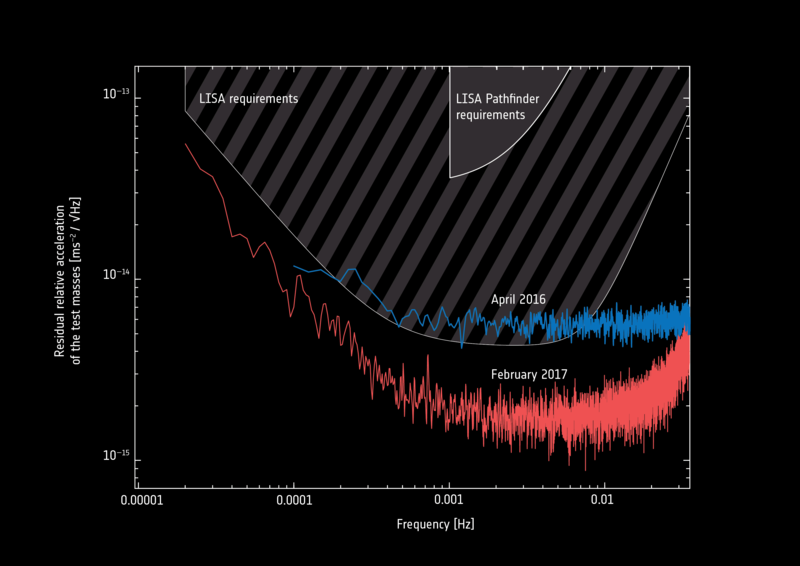 This plot shows the primary result from LISA Pathfinder's year and a half of science operations. The plot shows the measured level of imperfection from pure free-fall of the two gold-platinum test masses. 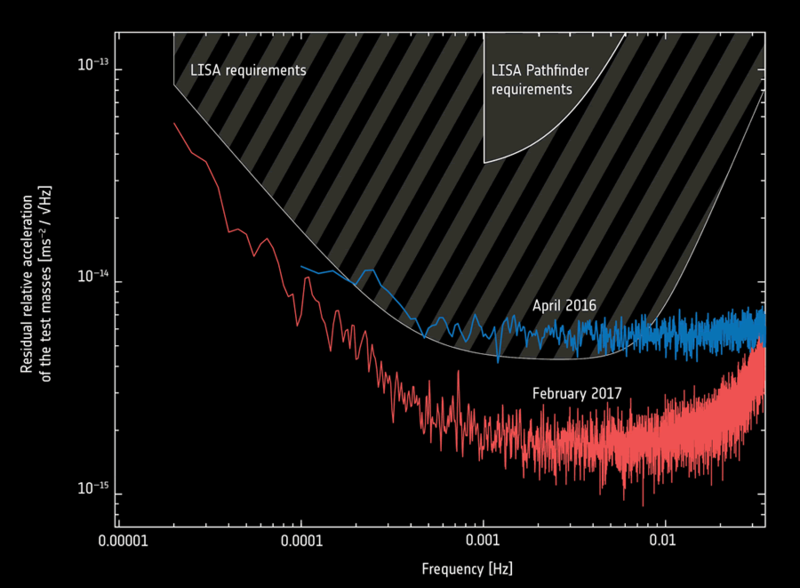 The solid and hatched shaded areas show the designed level of performance for LISA Pathfinder and LISA respectively. The blue trace shows the preliminary result from Pathfinder, which was obtained just two months after science operations began. The red trace shows the final result, obtained in February 2017 after the instrument was tuned to improve performance. 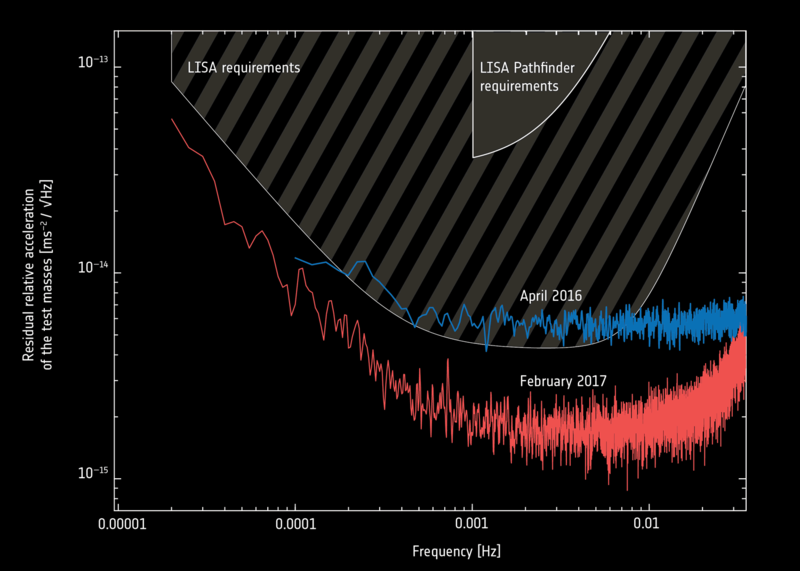 These measurements demonstrate that the technology developed for Pathfinder can be used as the basis for LISA's detection of gravitational waves. Press release from ESA discussing these results. 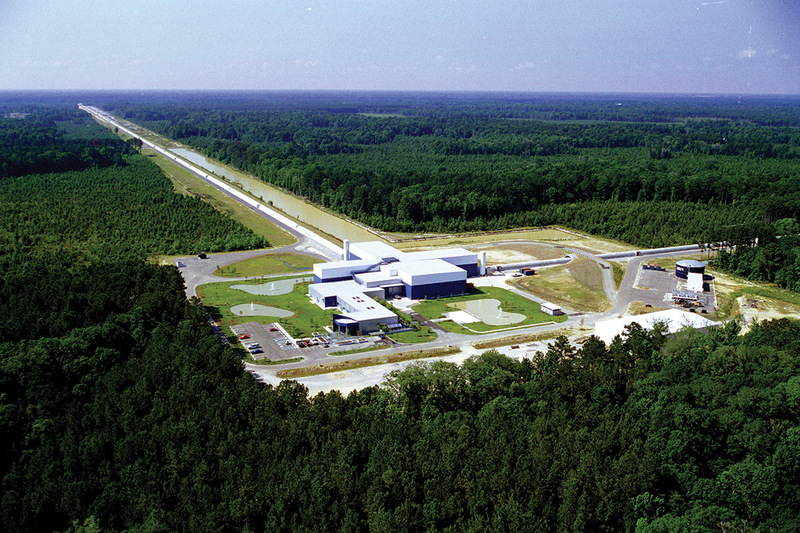 LIGO is a ground-based observatory that first detected gravitational waves. Click Image to Zoom. With their first few detections, LIGO and VIRGO have made significant contributions to our understanding of black holes and neutron stars. This graphic shows the masses for black holes detected through electromagnetic observations (purple); the black holes measured by gravitational-wave observations (blue); neutron stars measured with electromagnetic observations (yellow); and the masses of the neutron stars that merged in an event called GW170817, which were detected in gravitational waves (orange). The remnant of GW170817 is unclassified, and labeled as a question mark. Details/Credit: LIGO-Virgo/Frank Elavsky/Northwestern University. On September 14, 2015, the Laser Interferometer Gravitational-wave Observatory (LIGO), a ground-based gravitational wave observatory, made history by detecting the first gravitational waves from the merger of two stellar mass black holes. 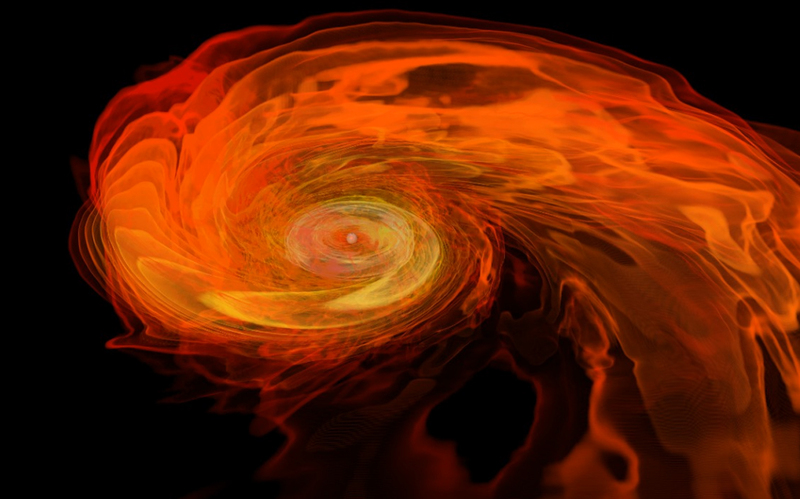 Since then, LIGO and its European counterpart VIRGO, have announced the detection of several additional black hole systems as well as a neutron star merger which also produced light detected by dozens of telescopes on ground and in space. This represents nothing less than the birth of an entirely new field of astronomy. As LIGO, VIRGO, and other ground-based detectors increase their sensitivity, the number and quality of black hole and neutron star merger events observed will increase. New kinds of events, such as nearby supernovae, may be detected as well. However, there are some gravitational wave sources that are not detectable by even the most advanced ground-based detectors. Gravitational Waves at very low frequencies have wavelengths larger than the Earth itself. Deploying an antenna large enough to efficiently detect them requires going to space. LISA's three spacecraft will create an equilateral triangle in space and the paths between each pair of spacecraft, referred to as LISA's arms, will extend millions of miles. By measuring distance changes in these arms caused by passing gravitational waves, LISA will be able to measure their amplitude, direction and polarization. Astronomers will use this information to learn about the sources in this previously-unexplored region of the gravitational wave spectrum. Led by ESA, the project is a collaboration of ESA and NASA. The European Space Agency (ESA) is leading the LISA mission and NASA will collaborate by leveraging the growing body of knowledge from the U.S. scientific community. NASA support for LISA will be at every level, including potential contributions to the design and development of the mission concept, providing portions of the instrument and other flight hardware, and participating in the operations and science data analysis. The details of the specific items and mission elements to be provided by NASA are part of ongoing discussions. Current discussions about NASA's involvement include items that could greatly increase the science output of the mission. Links to gravitational wave education resources for teachers and students.